Most problems with tile installations have to do with stained or cracked grout or cracked or broken tiles. Though grout is tough, when left unsealed it is quite porous and will stain. 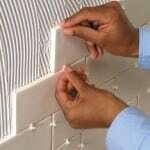 If applied improperly, it will crack, and, when that happens, tile will eventually work loose. Tile usually cracks or breaks either because something is dropped on it or because the surface that supports it shifts. Movement is generally caused by normal house settling, earthquakes, or a supporting subfloor that isn’t strong enough to handle the floor loads without deflecting. Of course, deflection doesn’t occur when tile is laid on a concrete slab, but many wood subfloors should be reinforced with an extra layer of plywood subflooring prior to tiling. Because liquids and foods can stain more-porous tiles, they should be treated with sealers that resist moisture. Be aware, though, that the sealers can change the natural look of stone or unglazed tile. A cracked tile can usually only be replaced, not repaired, so put some extras aside if you are installing a new floor, countertop, or wall. If a tile has a small, narrow crack, you may be able to fill the crack with paintable caulk and, if necessary, touch up the caulk with an artist’s paintbrush and acrylic paint. Try this first. If the repair is too obvious, you will have to replace the tile. 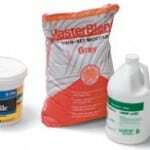 Follow manufacturer’s recommendations for cleaning glazed and unglazed ceramic and stone tiles and their grout. Wipe up any spilled food or liquid promptly because porous surfaces-and especially the grout-will stain easily. If there is a small, narrow crack in a tile, you may be able to fill the crack with paintable caulk and, if necessary, touch up the caulk with an artist’s paintbrush and acrylic paint. Try this, but if the repair is too obvious, you’ll have to move on to Plan B, which is quite a bit more involved. Plan B is to remove the tile and replace it with another just like it. If you happen to have a matching tile around, you can do this. Otherwise, you may have a very difficult time finding a replacement that is a perfect match. Spread adhesive, using a notched trowel. 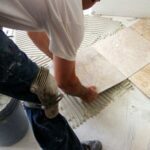 Replacing a cracked or broken tile isn’t as difficult as you might think. Of course, you can only replace the tile if you have or can find a match. If you can’t find a match on your tile dealer’s shelf, ask if there is a “bone pile” of rejects or extras you can check. 1Use an inexpensive grout saw or a lever can opener to scrape most of the grout out of the surrounding joints. 2Wearing eye protection, use a hammer and nailset to punch a hole in the center of the damaged tile. Be careful not to chip or crack any of the surrounding tiles, and avoid driving the nailset into the material underneath. 3Score an X across the face of the tile, from corner to corner, using a glass cutter. 4Rap a cold chisel lightly with a hammer to break away the tile, starting at the center. 5Pry up the pieces using a putty knife, an old chisel, or a prybar. Brush the debris from the area, and vacuum it clean. 6Paint the surface with latex primer (fill with vinyl spackle, if necessary) and allow it to dry. 7Using a small notched trowel, apply tile adhesive. 8Set the new tile into place and press it in with a slight twisting motion, taking care to maintain even grout joints all the way around. Using a rubber mallet or a hammer and block of wood, tap it gently to level it with the surrounding tiles. Remove any excess adhesive from the grout joints with an old screwdriver. 9Allow the adhesive to set up and then, wearing rubber gloves, mix the grout to match the existing grout. Apply it to the joints with your finger. 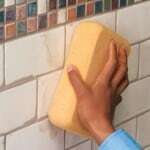 Clean any excess grout from the tile surface with a damp sponge.